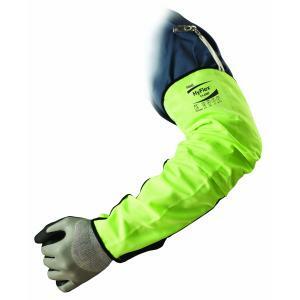 HyFlex® 11-200 offers the most comfortable sleeve in the Ansell range. Generous space in the arm area reduces sweat and itchiness. The anatomic design with adjustable forearm area enables freedom of movement so workers can do the job without constraints, increasing productivity. Enhanced safety is assured, thanks to a high visibility sleeve with Level 5 cut performance and Level 1 thermal protection. Better abrasion resistance (Level 2) and washability mean HyFlex® 11-200 offers improved total cost of ownership. Due to its ergonomic design and fixing system, worker acceptance will increase, leading to fewer accidents and injuries.